Product prices and availability are accurate as of 2018-12-27 13:06:44 GMT and are subject to change. Any price and availability information displayed on http://www.amazon.co.uk/ at the time of purchase will apply to the purchase of this product. 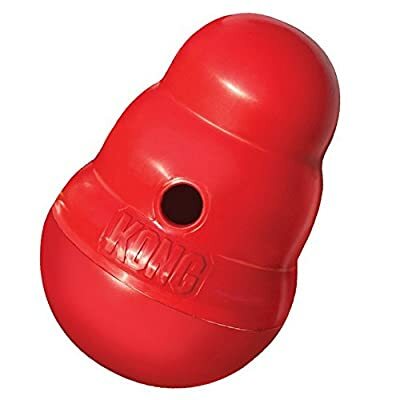 Food dispensing dog toy and feeder. Sits upright until pushed with a dogs paw or nose, then dispenses treats as it wobbles, spins and rolls. The unpredictable movement keeps the toy challenging. Use the Wobbler as an alternative to a dog bowl and to help extend mealtime and exercise your dog. Made of FDA food-approved, high-strength, plastic polymer.